Since I started writing this column for Mac guitarists, I have focused on software and methods for recording music. I have received a lot of emails asking that the coverage be expanded to include some of the other gear musicians use. Starting today, that’s what I’m going to do. I will start mixing up the coverage to include everything a guitarist needs from amps, guitars, cables and guitar straps to audio interfaces, and software to bring it all together. I decided to kick off this new direction with two killer amps from Peavey, the JSX Joe Satriani Signature Head and the Windsor Head. The JSX Head is one of those amps that you pull out of the box and just stare at for a while. It’s an impressive piece of hardware to look at, with its chrome finish and old-style switches. But we all know that an amp isn’t just about looks, it’s about sound and tone. The JSX is a three-channel amp—Clean, Crunch and Ultra. The Clean channel gives you controls for volume, bass, mid and treble, while the Crunch and Ultra channels have controls for gain and volume, bass, mid and treble EQ, and include a FAT switch for boosting your sound even further. The amp also has a master volume control, which really gives you a lot leeway to crank up the channel volume to get the most out of the tubes. At 120 watts, the JSX is packed with power and you really feel it when you plug in. After you have all the levels set up to your playing style for each channel, it is a dream to play. Being a huge Zakk Wylde fan, I play a lot on the Ultra channel. Unlike some amps I’ve listened to with heavy metal channels, the JSX’s Ultra channel isn’t so over the top that it just becomes one wild scream of notes. I hate listening to something that is indistinguishable from the feedback coming from the amp. I also like to play a lot of Eric Clapton and Angus Young. Setting up the amp to play either of these guys was pretty easy — none of the channels try to be more than what they are. If you go to the Crunch channel, you are going to get crunch, not metal. Turning the gain down, adjusting the mids and treble and you’ve got a great Clapton “Cocaine” tone in no time. The JSX also has resonance and presence controls, a noise gate for both distortion channels and a footswitch to jump between channels. As an added bonus for computer users, the JSX features a 1/4-inch line out with level control on the back, allowing you to go directly to your Mac and record the tone coming from the amp. 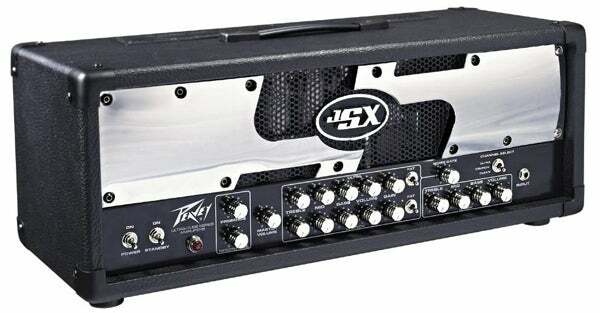 The Peavey JSX Joe Satriani Signature Head is a killer amp with versatility for a lot of music styles. With a list price of almost $1,700 and a street price of about $1,350, the JSX offers a lot of power and sound for the money. When I first looked at the Windsor head, it was sitting beside the JSX. I thought, these couldn’t have come from the same company. The Windsor has a serious retro look to it, making it a complete opposite of the chrome-faced JSX. To be honest, I didn’t expect much from the single-channel Windsor, especially after playing the JSX for so long. However, I ended up being completely taken with what the Windsor had to offer, especially for its price. When I first plugged my guitar into the Windsor, I had a crunch tone that just made me smile. I was expecting a very thin sound, but what I got was a tone reminiscent of a vintage Marshall JCM 800. Pushing 100 watts, the Windsor will give you an AC/DC-style crunch without touching a knob. The Windsor doesn’t have the edge that the Marshall does, but it is a very warm tone that can be used for a lot of different genres of music. The amp has presence and resonance controls, as well as a foot-switchable gain boost to give you a bit of extra power for soloing. I found the boost made the tone a bit too muddy for my tastes, but your mileage may vary. Since it’s a single-channel amp, you don’t have many choices for coloring the sound, but a stompbox will take care of those needs if you want that. And, when I used the poor man’s way of cleaning up a crunch channel—by turning the volume down on the guitar while cranking the amp volume—the Windsor actually cleaned up quite well. It’s definitely not the same as having a separate clean channel, but it does the trick in a pinch. The Windsor doesn’t have a line out, so if you plan to record you’ll need to mic the amp into your mixer or audio interface. The Windsor head costs about $400. If you are looking for an amp that will give you lots of crunch at a budget price, it’s worth a look.